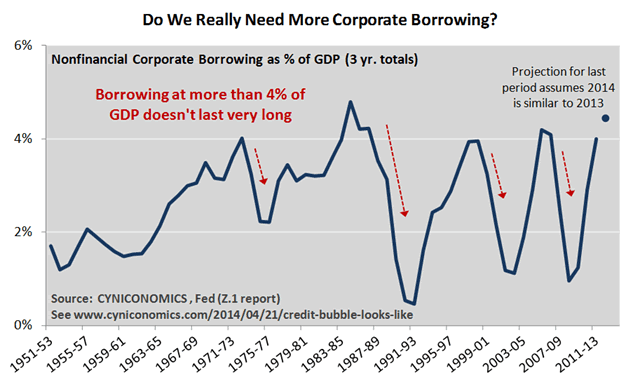 At over 4% of GDP, you might say that borrowing is too high, not too low, especially as this pace never lasts long. 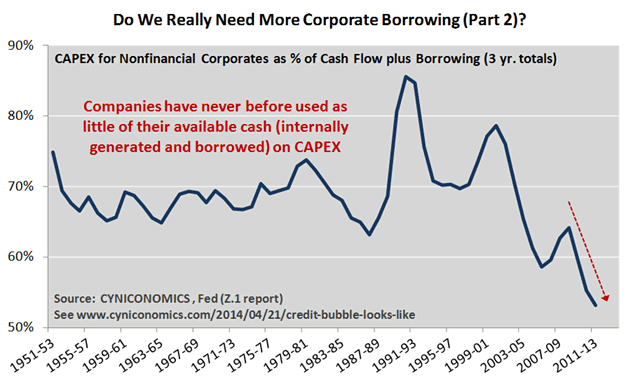 The bigger issue, though, is that companies are choosing not to invest borrowed funds back into their businesses. You may have seen recent posts by David Stockman or Tyler Durden, breaking down financial statements for IBM, in particular. They showed that IBM’s borrowing in recent years was matched almost exactly by stock buybacks. 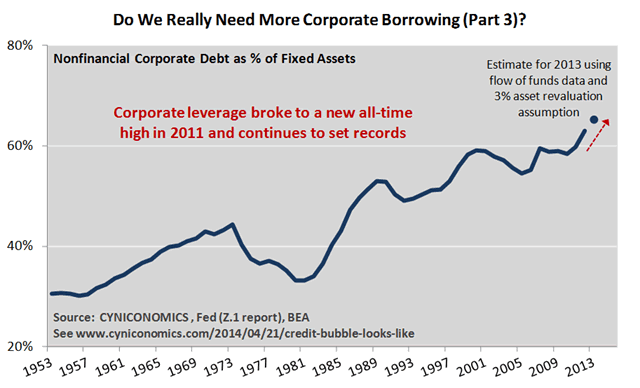 Clearly, this isn’t the kind of borrowing that helps the real economy, and IBM’s not alone. The spiral could continue awhile longer, and probably will, but it’s not sustainable. The longer it circles in one direction, the more strongly it circles back in the opposite direction once the inevitable cracks appear in credit markets. In other words, not only does the spiral explain much of what we’re seeing in today’s financial markets, it also describes part of the process that leads to the next recession. When will the debt super-cycle end? What’s more, the data also begs the question: When does the roller coaster of leverage peaks and troughs fly completely off the tracks? The idea that we may be in the late stages of a debt super-cycle isn’t welcome in some circles, but the fact is that leverage can’t trend upwards forever. Eventually, we’ll reach a point where the normal reflation no longer works. We may then begin a secular downtrend (as in the period from the Great Depression to World War 2) or, at a minimum, we’ll establish a sideways pattern that fails to make new highs. 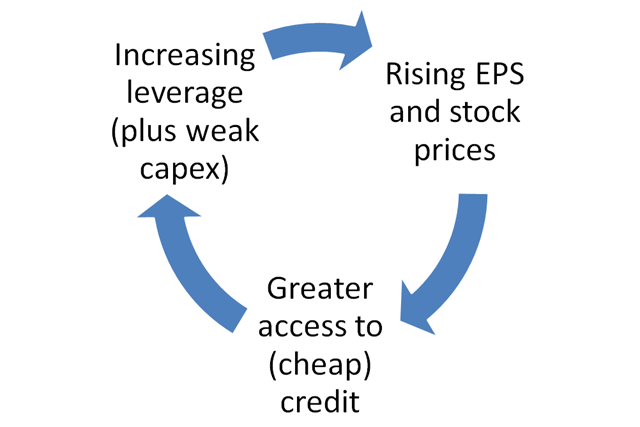 Either way, the business cycle won’t look quite like it did over the last 70 years of rising leverage, nor will it look like the last few decades of increasing financialization. Back to the question, can companies lever up as much as, say, 70% of assets? 75%? Maybe so, but it says here that the super-cycle ends well before debt reaches 100% of assets. It’s hard to say exactly where the breaking point is, but we’ll continue to share clues as we find them. In the meantime, one clue may be the bursting of the mortgage bubble in 2008. 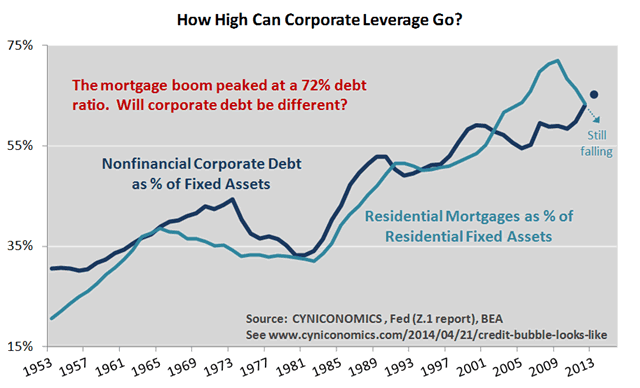 As you look at the last chart below, keep in mind that residential mortgage debt (backed by properties) and corporate debt (backed by productive assets) are fundamentally different. Or, maybe they’re not so different? You decide. Sidenote: Regular readers know that we’ve already taken a position on critical thresholds for government debt. See our Fonzie/Ponzi theory and follow-up posts here and here.